Watch the video: Fatal heroin overdoses are rising in Illinois. Some advocates say a bill waiting for Gov. Bruce Rauner's signature could help save lives. Some advocates and law enforcement officials say heroin use is rising in Illinois and that Chicago has one of the largest open drug markets in the country. According to state figures, 633 people died last year from overdosing on the highly addictive opioid. That's up from 583 deaths in 2013. But some advocates say a bill waiting for Gov. Bruce Rauner's signature could help save lives. That bill–sponsored by state Rep. Lou Lang–aims to make more accessible opioid antidotes that counteract the deadly effects of drug overdoses, including heroin. Tuesday, we’ll talk with David Cohen, a former addict who is now the vice president of substance abuse and co-occurring disorders at Insight Behavioral Health Centers; Marie Wilson, a reporter from the Daily Herald who won a Peter Lisagor award for a series of articles she co-wrote on heroin abuse in the suburbs; and John Roberts, a former Chicago Police Department captain who co-founded the Heroin Epidemic Relief Organization in 2010 after his son died from an overdose. Heroin use has reached epidemic proportions in America, according to the Center for Disease Control and Prevention. In 1999, there were 3,000 overdose deaths due to opiate medications; in 2008, that figure increased to 15,000. While Kasha says heroin addiction is a nationwide issue, it’s a huge problem locally. Hazelden Betty Ford Foundation in Chicago has seen admissions for opioid dependence soar: In 2010, some 12 percent of clients either identified opioids as their drug of choice, or were diagnosed with opioid dependence. By 2014, that number rose to 34 percent of outpatient clients. Over the past decade, Kasha says he’s seen a shift away from the use of prescription pain medications and more toward use of heroin itself. Pharmaceutical companies have made it more difficult for opioid pills to be crushed. Physicians are monitoring their prescriptions and are not overprescribing opioids as much. Increased public awareness. “Emerging adults and teens for a long time were getting drugs from their parents’ or grandparents’ medicine cabinets,” he said. While these factors have decreased the accessibility of opioid prescriptions, the demand for such drugs remains and, in turn, compels people to seek out drugs like heroin on the streets. “[Heroin] is readily accessible,” Kasha said. “The accessibility of heroin and opioids in Chicago is due in part to the city being a distribution drug route for the rest of the country that comes primarily from Mexico,” he added. When people purchase heroin, they don’t know exactly what they are getting. According to Kasha, the addictive nature of heroin varies based on its purity and how it’s used. Injecting the drug is the most invasive and physically harmful. Heroin can also be consumed as a pill, or smoked and snorted. Since opioids are used in the medical community to manage extreme pain, withdrawal from opioids, including heroin, is severe because “all the pain receptors are coming alive at once,” he said. The “telltale” symptom of heroin use, according to Kasha, is nodding. Someone using heroin will be sitting and appear as though they are nodding off to sleep and aren’t very responsive, he said. 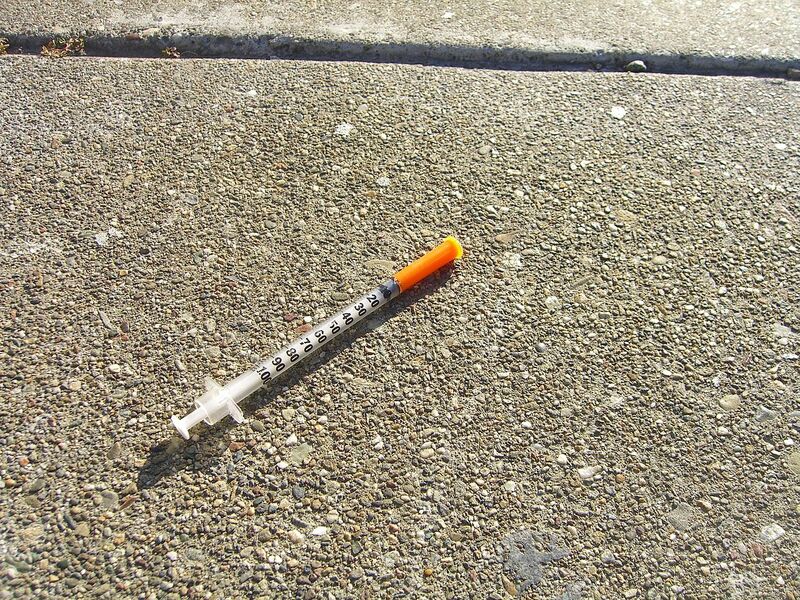 People who inject heroin may also have “track marks” at injection sites. Before treatment can begin, an individual will be assessed to see if he or she will be at risk for withdrawal. If someone is at risk, the physical symptoms need to be addressed first. If a client is trying to stop using heroin, methadone or a lower-level opioid may be used to better control the process and help the patient wean off the heroin without experiencing withdrawal symptoms, Kasha said. Hazelden Betty Ford Foundation takes a 12-step approach comprised of three parts: a biological/physical part which includes the detoxification; a psychological/cognitive portion which helps clients learn coping skills; and a spiritual component which helps a person create a sense of self and fill a spiritual void that either caused him or her to start using drugs, or was created by drug abuse. But there are options and hope, according to Kasha.